Association of AHSG with alopecia and mental retardation (APMR) syndrome: Alopecia with mental retardation syndrome (APMR) is a very rare autosomal recessive condition that is associated with total or partial absence of hair from the scalp and other parts of the body as well as variable intellectual disability. Here we present whole-exome sequencing results of a large consanguineous family segregating APMR syndrome with seven affected family members. Our study revealed a novel predicted pathogenic, homozygous missense mutation in the AHSG gene. WISP3 mutation associated with Pseudorheumatoid Dysplasia: Progressive pseudorheumatoid dysplasia (PPD) is a skeletal dysplasia characterized by predominant involvement of articular cartilage with progressive joint stiffness. Here we report genetic characterization of a consanguineous family segregating an uncharacterized form of skeletal dysplasia. Whole exome sequencing in four affected siblings and parents resulted in identification of a loss of function homozygous mutation in the WISP3 gene leading to diagnosis of PPD in the affected individuals. The identified variant is rare and predicted to cause premature termination of the WISP3 protein. Dr. Reza Sailani is the SNSF postdoctoral fellow in the Michael Snyder lab at Stanford University. 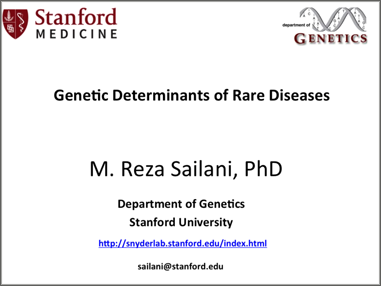 Sailani received his PhD in 2014 at the University of Geneva in Switzerland where he studied genetic variability and epigenetic alterations in Down Syndrome individuals with congenital heart defects. His current research interest lies in how genomic variability leads to the phenotypic variability and disease risks. He studies pathogenic variations leading to disorders, mainly Mendelian diseases. He also studies longitudinal omics profiling of pre-diabetic and non-diabetic individuals over periods of respiratory viral infections and immunizations..